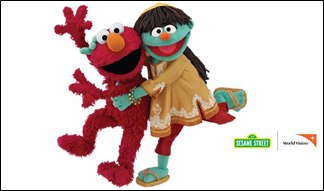 Raya, one of the newest members of the Sesame family, along with her friend Elmo, will teach children and families about positive health behaviors related to water, sanitation and hygiene (WASH). Originally developed with generous funding from the Bill & Melinda Gates Foundation, Raya is an adorable girl Muppet who remembers everything she reads and pays close attention to hygiene. As the largest nongovernmental organization providing improved sanitation, hygiene and clean water access in the developing world, World Vision and Sesame Workshop will leverage the breadth and long-term commitment each nonprofit has established throughout decades of work in Asia, Africa and Latin America. Child focused sanitation and health educational materials featuring Raya and Elmo are being designed to reach children and families through media, schools and community engagement programs. Communities that receive these critical messages about hygiene and sanitation are expected to see measurable effects on health and well-being. The partnership between Sesame Workshop and World Vision will begin by focusing on rural communities in Southeast Asia and Southern Africa where World Vision has a long-term humanitarian presence and manages hundreds of community and schools development programs. Sesame Workshop and World Vision believe that this partnership has the potential to save lives in the developing world by tackling the top causes of childhood deaths – including pneumonia and diarrhea caused by lack of hygiene, sanitation and clean water. World Vision is a Christian humanitarian organization dedicated to working with children, families and their communities worldwide to reach their full potential by tackling the causes of poverty and injustice. World Vision serves all people regardless of religion, race, ethnicity or gender. For more information, please visit www.WorldVision.org/press or on Twitter @WorldVisionNews.